I don’t even know what to say. What can you say after Gary Williams sustains the worst loss of his career? And that includes his time at BC and American. We just lost to Duke by 41. 85-44. I predicted a Maryland upset in this game. And you know something? That prediction was wrong. It was not correct. Inaccurate. Not correct. I love the attempt at spin control over at UMTerps. The headline on the home page? Milbourne scores 19 to lead Terps. Well, fiddle-dee-dee! I guess the game was OK after all. I don’t even know what this means for the team. Was it an aberration? A wake-up call? The death knell of the season? Of Gary Williams’ career at Maryland? The loss was so bad, it’s almost like you just need to burn the tape and move on. But the whole team looked so scared, so rattled from beginning to end, that I’m not even sure if that’s possible. Someone needs to, like, completely break down what’s left of the team and rebuild them all from scratch. As in, guys, this is a basketball. This is a chest pass. 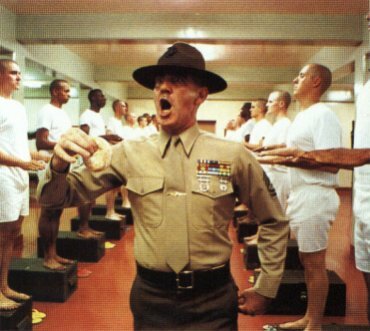 We need the drill sergeant from Full Metal Jacket as a new assistant. Another season circling the drain. I’ll spend the rest of the night at the bar trying to drink this game out of my memory. Go Terps. After the game I had to turn to karaoke to cheer me up. Karaoke.